Have you always wanted to be part of live theatre, but were afraid that, when the curtain opens, all you could think to do was lumber around on stage and grunt? NOW’S YOUR CHANCE! 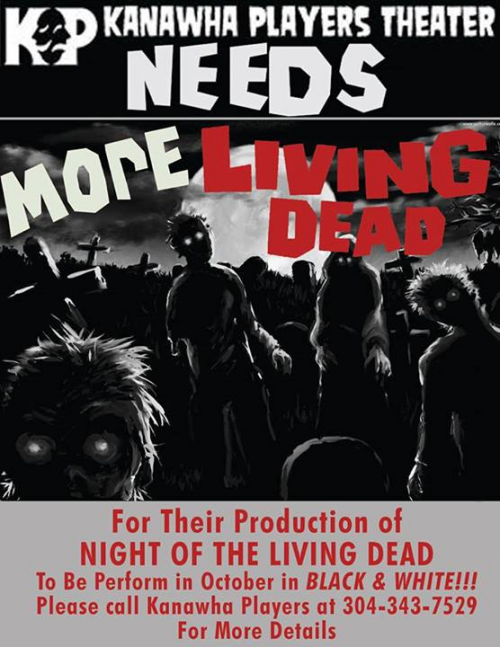 Kanawha Players needs more Zombies for their upcoming production of “Night of the Living Dead.” Call the number listed above for information on how you be part of the show. If you want to support KP without putting on Zombie make-up and jumping on stage, you can help them out buy buying a shirt!